The Highland Clearances were one of many blots of the development of the modern world. The story of the way that the Highlander crofters were forced from their land is well know. Over a period of around a century, though clearances did occur earlier, tens of thousands of some of the poorest people in Scotland were made to leave the lands that they, and their families had farmed for generations. Often their homes were destroyed in front of their eyes. In at least one case, the buildings were torched while a family member was still inside. The people were being cleared to make way for animals, cattle initially, then the extraordinarily profitable sheep and finally, in many cases deer. Scotland itself was transformed by the process, not just through the depopulation, but also her landscape became much more one of open "sheep walks", and less of farmed land. The people had many destinations. Some were shoved aside, onto progressively less and less arable land, till they lived off the worst that their landowner had. Others were driven towards new industries, particularly the kelp and fishing industries. Still more found themselves heading towards the major cities of Scotland, reliant on charity if the economic moment was not right and they weren't needed in the factories. Finally, many thousands ended up making a journey into the unknown, ending up in Britain's colonies, forming a wave of settlers who themselves, in turn, often took part in clearing the foreign landscape anew. Despite what the propaganda said at the time, the journeys to the new world's were seldom pleasant and life was harsh. Eric Richards' has written a comprehensive account of the clearances. He very much sites them in the changing economic circumstances of the 18th and 19th century. A time when the old landowners were no longer able pay their debts from the rents they could charge their tenants. A time when increasingly cash crops were offering huge profits in the run up to, and during the Napoleonic Wars. Some of these landlords, whose origins lay in the old clan system clearly believed that improvements to their lands were in a collective interest. The introduction of sheep would produce wealth that would benefit all. Those conservative crofters only had to accept in the inevitability of change and take up new opportunities or positions and they too would feel the benefit. This is an older version of the "trickle down" argument, that everyone would benefit. It was certainly not true in the Highlands, though as with today, "economic improvement" often brings wealth to a tiny minority. Richards makes much of the economic contradictions that plagued the landowners, indeed he spends some time demonstrating that a number of them did much to help the poor on their land. Some landowners invested large amounts in trying to create industrial opportunities for the poor farmers, though how many were to make the transition from subsistence farming to fishing was not something thought through by these wealthy individuals. Presumably work was just work to them. Other landowners offered enormous amounts in payments to encourage emigration. Sometimes these were not honoured and people arrived in Canada lacking clothes and food, never mind hope. The reality is, that such wealth was designed to get rid of the problem, by pushing the poorest away, so the land owners could continue to invest in sheep and earn their profits. The process was by no means inevitable. Resistance was frequent and fierce, though it barely graces the history books. Mobs would often try and prevent evictions, officers of the law and less legal hard men were fought and stoned. On occasion their papers were burnt and they were themselves evicted naked from the villages. A general uprising in 1792, led to hundreds of crofters gathering up to 10,000 sheep and herding them miles away from their lands. Later on resistance did force the evictions to be cancelled and clearances to stop. The crofters had limited economic power themselves, but increasingly they did have the support of public opinion. The sight of the poor and the old being thrown of their lands did not sit well with the new socially aware Victorian society, and the Highland question eventually led to limited parliamentary reforms to protect some tenancies. Interestingly, out of the struggle against clearances, the first radical MPs were elected to help bring the Crofters Law to pass. 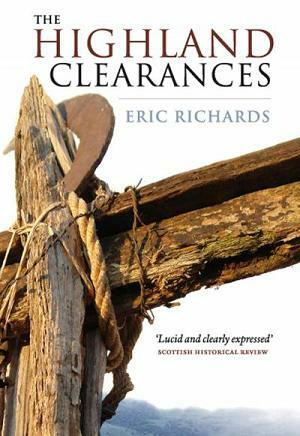 Richards has produced a readable and detailed history of the clearances. But it left me unsatisfied. I felt he concentrated too much on the economic argument. Like many he seems to see the Clearances themselves as a tragic, but inevitable part of the progress to a more modern world. Like the enclosures, or the displacement of those in the way of new canals and railway lines, the suffering was immense, but in the long term almost necessary for the greater economic development. That's not to say Richards has no sympathy with those whose lives were destroyed. He writes with passion and empathy for them, and by rescuing their struggles for justice from forgotten history, he shows he believes in the justice of their cause. So was their an alternative. In some senses this is idle speculation, after all the crofters were isolated and politically inexperienced. Though had their struggles linked up with the wider, growing movements for justice elsewhere in Britain, they may have stood a chance. Its notable that the later victories of the Crofters linked in with a growing sense of the need to protect people from the excesses of industrial capitalism. Like all too many historians, Richards makes one mistake. He cannot break from the logic of private ownership of the land - if there was an alternative, it was the destruction of the landowning class, or at least their acceptance that the Highland people had the right to do what they saw fit. Richards' book is however worth reading. The Highland Clearances are but one part of a tragic story of the development of capitalism. Richards points out that at the beginning of this millennium, 14% of Scotland was owned by just 21 nobles. The fact that we haven't yet broken from the logic of small number of people owning vast acres of land is reason enough to remember the crofters and the way at the forces of one of the world's most powerful states were directed against them. In the introduction to this volume the series editor feels obliged to justify the length of the work itself. 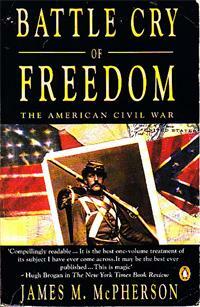 He points out that almost every other treatment of the American Civil War requires multiple volumes. James M. McPherson's book is compressed into a single volume, albeit of almost 900 pages and is lauded on the cover as "the best one-volume treatment of its subject". This obsession with size is a little strange, but nonetheless the work is an astounding piece of history. McPherson has skilfully combined what seems the key features of the events leading up to and during the Civil War and woven them together with a detailed, but clear analysis. I approached the book as a new-comer to this period of American history. With only a haziest grasp of some of the names and issues - Lincoln, Slavery, Confederacy and places like Gettysburg. I'd certainly recommend the book to someone trying to get to grips with the period. McPherson assumes nothing and if on occasion his treatment lacks enough detail, this is only for reasons of space. His detailed footnotes surely point the scholar to further reading. McPherson begins with an analysis of the situation on the eve of war. The United States appears very much as a collection of diverse states, to a certain extent in competition with each other and lacking it appears in a sense of collective identity and ideology. At the heart of this was the growing divergence over the question of Slavery. For the Southern States the question was one of survival - without this aspect to their economy, they would fail and to the North, increasingly for large numbers of people Slavery was an abhorrence that should be ended. McPherson deftly describes, sometimes in painstaking detail the growing confrontation between the two sides, and the great rainbow of opinions between the extremes. From a layman's point of view it becomes clear that a confrontation over the question becomes inevitable at a certain point. For the United States to survive as a whole the question of slavery has to be resolved, there cannot be a compromise. Northern Capitalism is increasingly based on free labour, Slavery anywhere in the US undermines this. In the South, the opposite is true. The capitalists there want to continue in the old ways, and the northern methods of making profits undermine their ability to benefit economically from slavery. War, once it comes, is appalling brutal. The earliest of battles were fought in the old ways, men charging fixed positions, defended by soldiers with muskets. The heavy, slow ammunition causing horrific wounds. Its in this sort of discussion that McPherson's scholarly work really shines through. Detailed analysis of the war is one thing, but the social consequences, such as the drafting of women on both sides to nurse the wounded is not left out. Just as women entering the workforce in Europe during World War I had important social consequences so did their involvement at this point in US history. My crude understanding of the war had lead me to believe that the North won on the back of its economic and industrial superiority. I was surprised to find that the North came very close on a number of occasions to losing. In part this was due to military ineptitude (there was plenty of this on both sides, particular from senior commanders). Though another important factor was the inability from both sides, but particularly the north, to press home military advantage. On at least two occasions the north could have finished the main bulk of the south's forces off on the battlefield but held back, letting them fight another time. One of the strengths of McPherson's analysis is that he understands that everyone involved in the war was going through change throughout the conflict. The war began as a war to maintain or restore the Union. It ended as an all-out war to end slavery. Many of the military leaders in the North were prepared to take the first, but not the second. Their unwillingness to destroy the enemy was based on their unwillingness, in the final analysis, to end slavery. Lincoln himself optimises this change. While slavery is the dominant question in the run up to the war, he himself only belatedly comes to the question of emancipation. Indeed, before making this his public position he goes through a whole host of other positions first - partial emancipation, a black homeland in South America and so on. As it becomes clear that the war must be fought to a military end it also becomes clear that this means the destruction of the institution of slavery in the south. The war becomes a revolutionary conflict - the North has to destroy the basis for the south's old strength. This is why the question of the involvement of black people in the North's military forces is so important. It is both a recognition of the fact that the North needed to mobilise everyone, and as a symbol of what the war has become. This review cannot hope to do justice to McPherson's brilliant book. There is so much inside - from the naval war, which saw the use of iron-clads for the first time, to the role of the United Kingdom and Napoleon, as well as the support from the ordinary people of Britain to the anti-slavery fight. The military history is fascinating too. Wars and battles cannot be separated from the social situation in which they are fought, and the descriptions and details of the conflicts are fascinating for the insights into the minds of the commanders and the ordinary troops. It is notable that the war bridged a period of military history; it began in the style of the Napoleonic conflicts and ended with the brutal attrition of trench warfare. The United States like most nations is contradictory. Its leaders spoke of freedom but its very existence was based on the destruction of the country's aboriginal people. Indeed many of those who fought slavery in the South, in turn took part in the final destructions of the Native American tribes. The American Civil War was the turning point for US history, the victory of the North was the moment when modern capitalism became free to develop as it needed, no longer restrained by the last vestiges of the old order. The stage was set for the twentieth century. McPherson's book tells this story brilliantly and deserves to be read and re-read. Marx's Civil War in France is both an impressive history of the Paris Commune – the short lived, but important moment in working class history, when working people rose up and took control of Paris, and a powerful polemic against the barbarity of the capitalist system and those who stand in its name. Marx uses the term Universal Suffrage as it would have been understood in his time. This was suffrage for Male adults only. Woman played, as Marx reports, a central role in the Commune and suffered equally the fate of their male Communards, but despite their role, they weren't given full democratic rights. The working class movement had to develop further before these were to be fully understood and accepted, even by its most advanced sections. The Commune wasn't just about radical democracy. Attempts were made to kick religion out of education and provide free education for all that needed it. The seperation of church from state meant that Priests feel back on the donations of their worshippers, as Marx quips, like the apostles they claimed to follow. 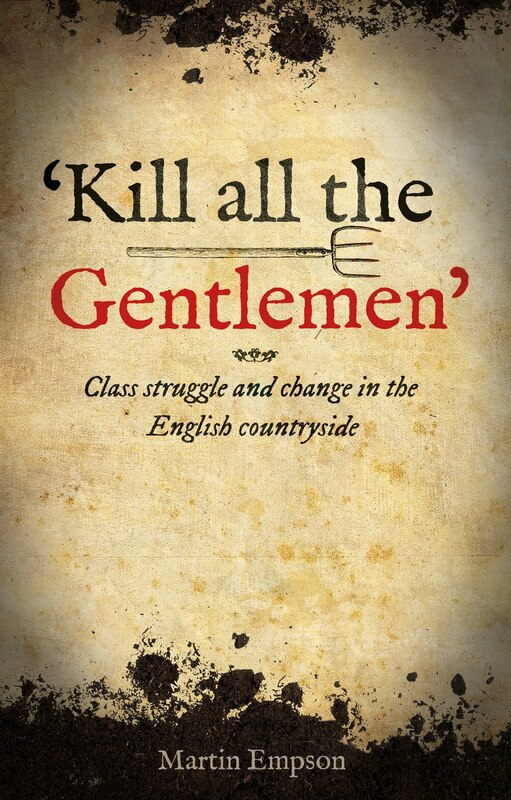 Indeed, shot through the Civil War, is Marx's sense of humour and vicious barbs aimed at those who opposed the Commune. And those that opposed it, destroyed it. Marx's points out that working people cannot simply seize control of the state and wield it in their interests. The state machinary must be destroyed and rebuilt in order to help the newly victorious class stabalises its power and defeat the old order. 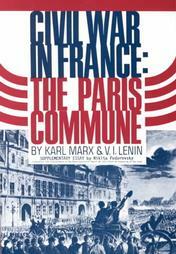 The most barbaric means were used to destory and isolate the Commune, and many thousands perished in its defense. If the enemies of the Commune highlight atrocities of the Communards, they do so to cover the fact that these were in retailiation for far greater crimes committed against innocent working men, women and children. Marx quotes independent witnesses to highlight these, and points out that the capitalists, despite their talk of freedom and democracy only care for the freedom to profit from other peoples labour. When this order is challenged, as the Paris Commune did, they will react with the utmost brutality to maintain the status quo. The Civil War is far from the complicated writings that many expect Marx's writings to be. Indeed it is one of the most accessible of his works, though some French history will help readers. 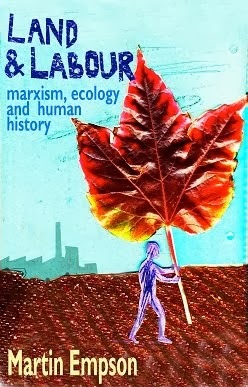 My edition has a very useful introduction by Frederick Engels, written on the 20th anniversary of the Commune, as well as some supporting introductions from Marx to put a wider context. Earlier drafts of the pamphlet are online and will reward those willing to delve deeper into this important revolutionary moment. Before reviewing this book, I want to mention how I came about it. On holiday just south of Oban on the west coast of Scotland, I visited Kilmartin. This small village is the centre of an enormous concentration of neolithic sites, including several impressive cairns, a few stone circles and not a few standing stones and inscribed rocks. Kilmartin has a very impressive museum including an extraordinary bookshop specialising in particular ancient history. 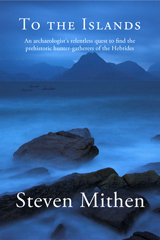 I encourage readers who are fascinated by the Mesolithic and neolithic periods of history to visit and support both the museum and its bookshop. I was lucky to find Steven Mithen's book there, because holidaying on an island very near many of the places mentioned inside, helped me picture and understand his work more. Mithen is the author of After the Ice a book that I consider one of the best introduction to the lives of ancient humans living in the post ice-age world. His latest book, To the Islands is much less an academic work and more of a archaeological autobiography. Mithen describes how his career has been tied to the people of the Mesolithic era since the earliest days of his PhD studies. The Mesolithic people were the hunter-gathers who spread across the world at the end of the last ice-age. They lived, in a myriad of different ways depending on the landscape they inhabited, before with the arrival of agricultural practices, the “neolithic revolution” led to a new mode of production. Mithen believes that to understand the people of the Mesolithic requires a detailed understanding of their lives in the context of the environment and landscape they inhabit. The fish they could catch, the deer they could hunt, the trees and plants that surrounded them, the way they would have been inspired by the land itself. His early research using computer models to predict how hunter-gatherers might exploit the natural resources, led to repeated visits to the Hebrides to try and understand the lives of these people. Mithen is enchanted by the Hebrides, their culture, the environment and the modern people, as well as the historical inhabitants. The remoteness of many of the islands, despite the popularity of places like Jura as modern holiday destinations, has helped protect many important prehistoric sites. This remoteness leads to further problems. Mesolithic archaeology cannot rely on hunting for visible remains like stone circles. Rather, the archaeologists must look for more subtle clues. Shell middens – the piles of waste left by prehistoric peoples as they extracted food from limpets and mussels are gradually covered by grass. Rabbits can dig out the prehistoric shells, littering them outside the entrances to their warrens and provide a clue for archaeologists. Other clues can be found in subtle surface bumps, or as Mithen tries to show, simply looking at the landscape and trying to get the mindset of an ancient hunter-gatherer. What would you look for as a hunter-gatherer on a Scottish island? Easy access to fish, woodlands and shelter? Where might you sit? In the decades of research and excavation that Mithen does, with dozens of students and helpers, he gradually comes to understand more about the prehistoric life. On several occasions, Mithen quotes an earlier archaeologist, Lewis Binford about how archaeologists must “recalibrate their perspective of hunters and gatherers from the five foot excavation unit at a single site to an area of more than 300,000 square kilometres”. With this view, Mithen shows how hunter-gatherer life in the Hebrides was spread over island after island. One a source for flint for tools, others a good place to fish or find shellfish, another a ideal hunting ground. Life then wasn't stagnant, nor was it necessarily based in one place, instead it was spread across time and space. The landscape was a living part of human life, not a separate thing. Mithen's book is wonderful. By choosing the autobiographical format, he has shown how archaeological understanding must develop over time, how intellectual ideas must be challenged and developed regularly to allow for new data and information. For those amateur archaeologists, two things will be particularly pleasing about Mithen's book and his work. One is the detailed descriptions of the archaeological processes, how and where they sink trenches, why it takes so long and costs so much. The other is the importance he gives to amateurs. Countless times he visits local people and is shown their collections of Mesolithic tools. He frequently relies on local knowledge from farmers and others to find the best sites and is clearly inspired by the way that people are interested in the history of their place, even thousands of years ago. One thought popped into my head repeatedly while reading this book. The world of academia that Mithen inhabits, a world of grant applications and quests for funding, is one that must be getting tighter and tighter. In fact his search for funding and support for his work makes up an important theme of the book. I don't doubt it is easier to get money to dig up a site of national importance or a famous image. But archaoeological work must rest on all history, even the small charcoal remains and broken tools that dominate the historical record from our hunter-gatherer past. As funding gets further squeezed by Tory cuts and as education gets still further restricted to those who can afford it, how will academic subjects like archaeology cope? Mithen describes the passion and enthusiasm of his students and helpers. But if there is no cash to fund digs, how will the next generation of archaeologists develop and learn? Mithen is clearly someone prepared to fight for his subject in the wider world. We'll need him and others like him in the struggle to understand our past, but also to ensure that in the future we can continue to learn. If you can ignore the somewhat sycophantic paeans to Al Gore that make up some of this book, and the all too demoralising hopes vested in the election of a Democratic government in the United States, then there is much to get out of this book. The author is a distinguished scientist who has been part of those investigating climate change and its environmental impacts for many years. His speciality interest is ice, in all its forms. The thousands of glaciers, the millions of cubic metres that form the polar caps and those on Greenland and mountains around the globe. The first section of this book is a history of the exploration of the poles. Pollack is astute enough to locate the era of polar exploration within the imperial expansion by the major powers. The poles were the last, unexplored and unknown territories and it was not until the 1950s that governments agreed that Antarctica was to be used for science rather than a mineral grab. Much of the rest of the book is an exploration of the causes and impacts of climate change. 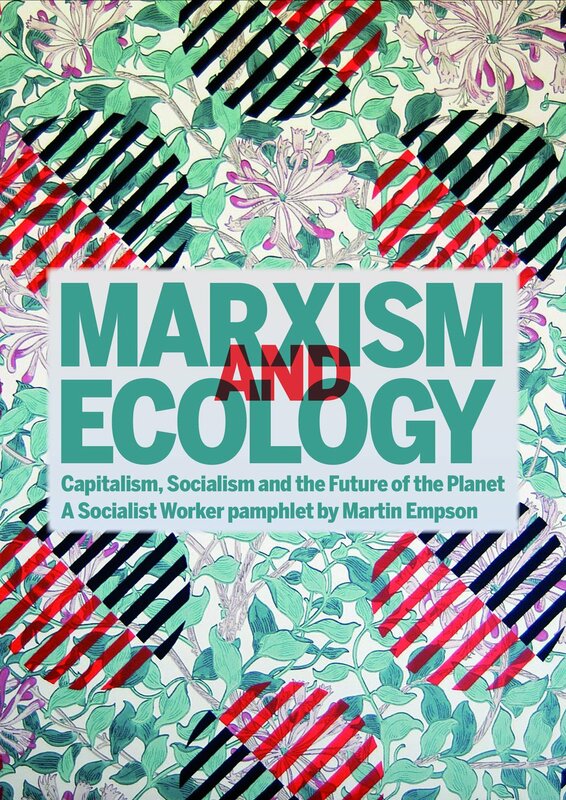 As many others have done before Pollack explores the way that from the industrial revolution onwards capitalism has poured countless tonnes of greenhouse gases into the atmosphere. Pollack is a excellent populariser of scientific ideas and his explanation are easy to follow as well as illuminating. He doesn’t duck some of the more complex ideas and takes on the climate sceptics who seem prepared to let us all cook in a warming world, simply to bolster their own distorted social agendas. Pollack tries to pitch the questions that arise from climate change through the impact on the world’s ice. Ice he argues, is a major ecological resource for billions of people. The agriculture, drinking water and sewage systems of millions of people in cities all around the globe depend on the melt water from mountain snow caps and glaciers. As the world warms, this is increasingly under threat, and the question remains unclear… what will happen to these people. As the ice melts, millions more face floods and extreme weather. Pollack looks at the 108 million people who live on land less than three feet above sea level and worries about how the world will cope with them fleeing their farmlands. Using analogies with environmental systems in the past, Pollack shows what might happen if we pass some of the tipping points that mark the transition from one stable situation to another. Again the prognosis is bleak for millions of people. Which brings Pollack to solutions. Sadly, this is the book’s weakest point. Pollack points out, rightly, the technology ease with which these problems could be solved. Governments need to urgently switch to low and zero carbon technologies, invest in public transport and so on. Pollack can only understand their hesitancy to do this due to lack of willing. He doesn’t see any structural problems within the political and economic system we have to this moving forward. Its why his mate Al Gore was unable to deliver real change during his vice-presidency and why emissions rose during the Clinton era. That he has hopes for Obama shows that he doesn’t understand the blame lies within a system geared to profit, rather than human needs. That said, there is much here of interest. Pollack’s book is yet another stern warning in the face of growing environmental crisis. I disagree with some of his points - I think he puts over emphasis on the problems of population, and downplays the questions of big business. But his honest and straight manner deserves a wide readership, particularly in his home country. Strategies for taking the question forward and winning the change needed will have to be found elsewhere.